When I heard that the Ichinoseki area is called “the home of mochi“, I thought of New Year’s Day. Or rather, I should say New Year’s Eve when my family geared up for massive production of mochi for the whole family and extended family at the holiday. We literally spent the entire day making so many huge batches of gooey, white rice dough, then forming them into round shapes of various sizes and big flat 2 cm thick sheets. If I try really hard and stretch my memory way back, I vaguely remember my family used to make green, pink, and white tri-color diamond shaped mochi for Hinamatsuri or Girls’ Day to display on a platform with dolls. Growing up, mochi to me was for special occasions, though, more associated with offerings for countless gods we believed we had all around the house or in the garden, for ancestors and for the family, not really for entertaining guests. 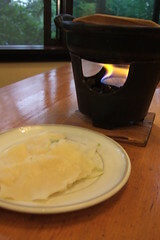 Most of the time, we cooked mochi in either miso or soy sauce with katsuobushi bonito broth base as zōni or grilled it, again, with soy sauce. Other than that, I do not remember being too creative with the sauce or broth. Last week, I visited a restaurant run by Seiki-no-ichi Shuzo, sake and beer brewer in Ichinoseki, hoping to find the answer. Ichinoseki is located in the southern part of Iwate prefecture, a good base for visiting the Hiraizumi area. This part of Japan has been nominated as a World Heritage Site for historical places such as Chuson-ji, Motsu-ji and many others that flourished in the 12th century. Conveniently located only 10 minutes away from the JR Ichinoseki Station, the old brewing site of Seki-no-ichi Shuzo with kura and brick brewing facility from around the turn of the century, offers a lot to many people – something to enjoy for everyone. First, I visited their sake brewing historical museum with old tools, pictures, and a toji room showing how things looked a long time ago. Then, they took me around to their tasting room, restaurant, beer brewery, and beer pub. In the center of these historical buildings, there’s a very nice courtyard with tables. If you go there after August, you will see their almost completed standing sake bar in one of these buildings. Their menu offers a wide range of choices from contemporary izakaya food to traditional local cuisine. I saw some interesting things on the menu: The Fujiwara zen– a course replicating some of the dishes from the Fujiwara clan, the lord who had the entire northern region around 12th century, various mochi dishes including zōni and nabe. 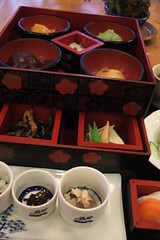 At the restaurant, I ordered hatto & mochi set and sake. I got the mochi part, but I could not really picture hatto part. “Hatto” in this area is nabe or hot pot dish with flat fresh pasta teared up by hands then cooked in a pot with simple broth and veggies. According to the restaurant, this type of flour based cooking is what people in the area used to eat everyday. This is very similar to what I learned about Senbei jiru from Hachinohe. Mochi cuisine around Ichinoseki is for special occasions, such as weddings, funerals, or even over 60 occasions a year according to this Japanese site that lists a mochi calendar. 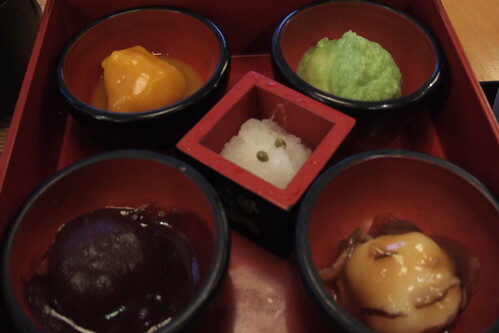 In the Hatto and mochi set I had, there were four kinds of mochi sauce; anko or sweet red bean paste, sweet kabocha or pumpkin paste, zunda or sweet green soy bean paste, and sweet starchy ginger flavored sauce with vegetables and soy sauce. The lady who brought out the meal told me specifically to follow that order. Other dishes came as set were grated daikon with vinegar, koya dofu cooked in broth, hijiki seaweed cocked in broth, grilled fish along with pickles and little salty dishes. Not being used to eating sweets before the meal and having sake with the meal, I asked the lady “before eating grilled fish and other dishes?” I am still puzzled by the order I was supposed to eat the entire meal, but I can imagine sugar was rather precious in the old days and people just had sweet mochi as the meal. Mochi meals themselves may not sound so exciting as to entice people for a special trip to Ichinoseki. Though, combined with amazing historical sites of Hiraizumi, beautiful boat ride through the serene Geibikei Gorge, and a short distance to the quiet coast line with abundant seafood make this area very attractive destination to visit. No impact from the earthquake in this area other than the fact all the tourists are canceling the trip. To view more pictures from the restaurant or from the sake museum, please visit tokyofoodcast on flickr. I’m so relieved to learn this place is still in business. I was so happy to be able to dine there a few years ago, after becoming a vegan, as there are few many options, and I thoroughly enjoyed their mochi set! Their local sake was also great, too. I am glad to hear that. I have to revisit the area to soon.